Hours prior to the implementation of the model code of conduct, the Punjab government reached out to the industrial sector also by offering a one-time settlement (OTS) scheme for all loans taken from the Punjab Small Industries Development Corporation (PSIDC) and Punjab Agro Industries Corporation (PAIC). The Sant Samaj, led by Baba Harnam Singh Khalsa, head, Damdami Taksal, and radical Sikh organisations have criticised BJP minister Laxmi Kanta Chawla for organising a religious function of Divya Jyoti Jagrati Sansthan at her residence here last evening. Central grants bestowed on Gurdaspur is likely to be made an election issue against BJP MP Vinod Khanna with Union Minister of State for Industries Ashwani Kumar managing a third project for the constituency, one day prior to the implementation of the model code of conduct. After a visit of All-India Congress Committee (AICC) observer GS Bali, who is an MLA from Himachal Pradesh, to this town today, six Congressmen have emerged as front runners for the party ticket from the Sangrur Lok Sabha seat. The Punjab Youth Congress (PYC) today reviewed its poll preparedness at a meeting of district presidents and state office-bearers here today. Unfolding his plans for the coming elections, PYC president Ravneet Singh Bittu said special teams had been constituted to ensure party presence at every polling booth to prevent rigging or booth-capturing. If success stories do not yield something more than success, they need not be replicated. At least this is what the Punjab government thinks. Minutes before the Model Code of Conduct came into being, the Punjab Cabinet approved Rs 2 lakh financial assistance to families of farmers and farm labourers who committed suicide on account of farm indebtedness. The Cabinet has decided to cover all such cases of suicide since 2000. DCs have been asked to ensure compliance. Health Minister Laxmi Kanta Chawla today lodged a complaint with the SSP here against the Editor and reporter of a Punjabi daily published from Mohali for trying to endanger communal peace and harmony by writing an inflammatory article in the daily last month. Dr Karan Singh, chairman, Indian Council for Cultural Relations (ICCR), inaugurated Sanghol Heritage Institute here on Saturday. The Punjab government has appointed Darbara Singh Kahlon, former schoolteacher, as the state information commissioner. Less than three months after the Punjab and Haryana High Court directed Punjab’s Additional Director-General of Police to look into assets acquired by police and non-police officers in and around Chandigarh, it now wants two task forces to report on encroachments on government land in the area. Supreme Court’s safeguards against illegal detention are still being violated in Punjab. The decision, which was approved during a meeting of the cabinet here today, was notified immediately to ensure the sops could be offered to promoters of sick units. The scheme is open for loss-making units only and is open for 90 days. In case of loans from the PSIDC, company promoters will have to pay the outstanding principal plus expenses and interest. In case of riot-affected companies, it will be principal plus expenses and interest of 4 per cent. In case of non-performing assets (NPAs) it will be principal plus expenses and 8 per cent interest and for NPAs under liquidation, it will be principal plus expenses and 10 per cent interest. NPAs with tangible securities will have to pay the outstanding principal plus expenses and 12 per cent interest. Companies taking loans from the PSIDC will have to submit 15 per cent of the total amount along with their application, 30 per cent within 30 days and the remaining amount within two years in eight instalments, for which an interest of 13.2 per cent will be charged. Companies opting for lump sum payment within 90 days will be eligible for a rebate of 5 per cent on the OTS amount. The units, which are under liquidation, can also opt for the scheme but will have to withdraw from arbitration, Industries Minister Manoranjan Kalia disclosed while giving details of the scheme. He was accompanied by Secretary (Industries) SS Channy and PFC Managing Director VK Sharma. Kalia said in case of the PSIDC, the corporation was saddled with a total outstanding loan amount plus interest of Rs 1,909 crore. He said this was due from 177 companies. In case of the PFC, the total outstanding amount was Rs 2,387 crore while the principal amount outstanding was Rs 212 crore only. There are 2,387 defaulting accounts as far as the PFC is concerned. The government has also introduced the OTS scheme for equity settlement. The OTS amount will be worked out based on amount invested plus simple interest at the rate of 10 per cent from the date of disbursement plus expenses. In case of OTS for loans taken from the PFC, people who have taken Rs 1 lakh need to pay only the outstanding amount plus interest. Those taking loans for purchasing up to two vehicles will also have to pay only the outstanding amount plus expenses. For loans up to Rs 5 lakh, the loanees will have to pay the outstanding amount plus 20 per cent interest. Loans above Rs 5 lakh will be settled as per the policy of the PSIDC. The Sant Samaj today asked the ruling SAD to snap ties with its alliance partner BJP on this issue, saying that by organising the function, the Health Minister had hurt the religious sentiments of the Sikh community. They also urged Akal Takht to summon BJP MP Navjot Singh Sidhu for he participated in the function. The representatives of various Panthic organisations were here to take part in a seminar organised by the Khalsa Action Committee and the Dal Khalsa to mark the birth centenary of Sikh scholar and author of the Anandpur Sahib resolution Sirdar Kapur Singh at the auditorium of the Chief Khalsa Dewan. However, talking to The Tribune, Chawla said there was nothing wrong if any religious organisation recited hymns from a holy scripture. She said the sadhvis of the sansthan recited hymns from holy Hindu scriptures to mark the occasion. Senior religious leaders of the sansthan, including Vaishnavi Bharti, Hari Archana Bharti, Swami Gagnanand, Mahatma Harish, Swami Rajdip, Swami Chynmyanand, and senior bureaucrats were among those who participated in the function. Meanwhile, Sidhu said being a representative of the people, he was suppose to attend all religious and social functions in his constituency. Ashwani is credited with bringing the Rs 63-crore machine tool cluster project to Batala, which falls in the constituency besides a collection centre for the proposed mega food park. Sources confirmed that the Centre has approved a project initiated by the Rajya Sabha MP to establish a polytechnic in Gurdaspur yesterday. In a letter written to the MP by Human Resource Development Minister Arjun Singh, it has been revealed that Gurdaspur falls under the category of places where there is no polytechnic at the district level and that it would be eligible for financial assistance of up to Rs 12.3 crore for establishing the institution. The sanction of the financial assistance for the polytechnic at Gurdaspur would be considered under the “sub-mission on polytechnics under coordinated action for skill development” in the next financial year, according to the information made available to the MP. The polytechnic is proposed to be developed as vocational training centre of excellence. The interest shown by Ashwani in bagging the polytechnic for Gurdaspur as well as being instrumental in the creation of a machine tool cluster at Batala, for which the Centre will give Rs 44 crore, indicates he is pitching himself as a candidate from the Gurdaspur seat. Sources said since the Congress has not taken a policy decision on whether to field Rajya Sabha members or not, he may have to wait it out for some time. However, he may get the nod in case the party fields another Rajya Sabha member Ambika Soni, who is the running favourite from Anandpur Sahib. Other Congress candidates from Gurdaspur include former minister Partap Singh Bajwa and Raman Behl. Sangrur MLA Surinder Pal Singh Sibia, Barnala MLA Kewal Singh Dhillon, former Punjab minister Jasbir Singh Sangrur, former Sangrur MLA Arvind Khanna, Rajinder Kaur Bhattal’s son Rahul Inder Singh Sidhu and member of the PPSC)Ajaib Singh are the front-runner aspirants for the ticket. Former Punjab Finance Minister Surinder Singla is also said to be an aspirant of the ticket. Sibia, Dhillon and Jasbir met the observer personally while representatives of Khanna, Sidhu and Dr Singh met him on their behalf. Sibia seeks the ticket on account of his mass base in the area, Dhillon for his role in getting the district status for Barnala and its development, Jasbir for being a candidate from Backward Classes, Khanna for his mass base in the constituency, Sidhu for being a candidate of the youth, and Dr Singh for his contributions to the Congress in the past years. Bittu said to the office-bearers, “Voters do not want false promises but meaningful solutions to their problems. Our campaign should highlight friendly welfare policies as well as economic policies of the UPA government among the general public”. He emphasised the need to emulate AICC general secretary Rahul Gandhi’s vision to strengthen the party at the grass-roots level and try to pool in young energy for campaigning. This year the Sarv Sikhya Abhiyaan (SSA) authority has saved about Rs 5 crore from publishing of its own textbooks which it gives to all general category students in government schools. The books are ready, waiting to be delivered to students who begin a new session in April this year. Till this year, the Punjab School Education Board (PSEB) was publishing these books as part of the several lakh textbooks that it gets printed each year. The board is, however, now insisting that it would print the SSA books also as publishing of books is the only way it can earn its running costs. Getting textbooks published has been the board’s big business. It first buys paper. The rolls of these papers are stored in godowns for which the board pays a heavy annual rent. Printers are then chosen and books printed. These books are then sold in the open market and also “sold” to the SSA, to be distributed free of cost to all the general category students from Classes I to VIII. For free distribution to SC and BC students, the board sells these books to the state welfare department. The board also gives 30 per cent discount to SSA on the books it buys and still manages to make a profit of several lakhs. While the SSA sees this as having saved money and also provided good quality books on time to the students, the board sees it as SSA eating into its income. Board chairman Dr Dalbir Singh Dhillon said, “The examination fee we charge is used to conduct examinations. If the board is not allowed to print books how will it run? The education minister already knows that the work of printing book is of the board and it is for the government to take a final decision on the issue,” he said. He added that the SSA had managed to get the books printed cheap as they did not have to pay any royalty to the authors and the content given to them was ready to use. Obviously with an eye on the parliamentary poll, the Cabinet has also decided to accept in principle the recommendations of the Fifth Punjab Pay Commission from January 1, 2006, as soon as the report was submitted to the government. The commission was likely to give its report by next week, a spokesman for the government said. In another decision, the Cabinet also approved to upgrade the post of chief coordinator in Udyog Sahayak to the rank of additional director with the same nomenclature for the implementation of the Punjab Industrial Facilitation Act, 2005, in right earnest. Further the Cabinet approved to withdraw the termination letter issued on October 10, 2002, to 787 panchayat secretaries who are working in the Rural Department and panchayats and whose services have been regularised by the council of ministers on January 1, 2009. The Cabinet also gave its approval for amending Section 7 of the Rural Development Act, 1987, to promote better agriculture for higher production, including agri business and agri processing, accelerate comprehensive rural development, including the construction/repair of rural roads, streets, streetlights, dharamshalas, panchayat ghars, canals, drains etc. The veil of secrecy over the little-known life of Maharaja Duleep Singh, the last Maharaja of the Sikh rule, has finally been lifted. Years of research by UK-based Sikh historian and writer Peter Bance (Bhupinder Singh) is now available in the form of a book on the life and times of Maharaja Ranjit Singh’s successor, dispelling several myths about the erstwhile scion of the 19th century Punjab. In Chandigarh to attend a lecture on the preservation of Sikh heritage overseas, Bance shared some insights into the life of Maharaja Duleep Singh, narrated in his second book titled, “Sovereign, Squire & Rebel,” with The Tribune. According to Bance, the Duleep Singh virtually rebelled against Queen Victoria despite befriending her on grounds of injustice and attempts to reclaim his lost Sikh kingdom. The public image of the Maharaja, created by the British, is that of a person lost in leisurely pursuits. Bance is a third-generation British-born Sikh; his grandfather migrated to the UK in the 1930s. Says he, “My research has taken me from tiny English villages where I looked for old retainers and servants of the Maharaja’s family to the few remaining cognates of the Maharaja’s family in India”. 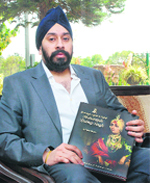 Renowned author Patwant Singh writes in his forward for the book: “The purpose of this fine book by Peter Bance will be best served if the reader remains focused on the reality of what happened during the10 years after Maharaja Ranjit Singh’s death, and till the time Duleep Singh died in a faraway land. British historians excel at verbal nobility in describing their own past glories and explaining why they went to war and the exemplary manner in which they conducted it. But reality can be quite different”. He proudly recollects how in 2008 he was responsible for the discovery of the gravestone of Maharani Jinda Kaur, in a London cemetery, which Bance later arranged to be permanently housed at Thetford Museum. He says, “The story has not ended with this book; I will continue to tour Punjab, collecting fresh information for my future project”. Chawla alleged that the reporter had purported certain remarks to her in his paper with a purpose to harm her political career spanning more than four decades. She described the article as an attempt to create a wedge between two communities. He lauded efforts of setting up the institute in Sanghol Education Complex, which would help in reviving Indian heritage and culture. HS Matewal, Advocate General, Punjab, said it had already been decided in principle that Sanghol Educational Complex would soon be accorded status of a deemed university. The institute is being set up to provide a global centre of India’s rich cultural heritage. Kahlon belongs to a village near Dinanagar, Gurdaspur, and has remained a teacher for 40 years. A prolific writer, Kahlon has penned over 2,000 articles in several Punjabi newspapers. He had also got the Shiromani Punjabi Patarkaar award. A masters in political science, Kahlon has also worked extensively on the system of government functioning in West Bengal. “I qualified for the Punjab Civil Service in 1973 but left it as I could not do many of the corrupt practices,” he said talking to The Tribune. Disposing of the “Nayagaon land grab case”, Chief Justice Tirath Singh Thakur and Justice Hemant Gupta made it clear the two committees would submit the reports to the state chief secretary. Another report in the matter by ADGP Chander Shekhar too would be placed before the chief secretary. The entire exercise has to be completed in three months. The petitioner has been asked to make a representation to the state director-general of police for security. Pronouncing the directions in an open courtroom, the Bench elaborated one task force would comprise revenue authorities and would be headed by the deputy commissioner concerned. The other task force, comprising forest officers, would be headed by the conservator in charge. Taking up the matter, Justice Ranjit Singh had observed: “It is a case where valuable property in and around Chandigarh is a subject matter of dispute between senior police officers. The Apex Court in DK Basu versus the State of West Bengal had laid down specific guidelines required to be followed while making arrests. But a report submitted by a chief judicial magistrate to the Punjab and Haryana High Court clearly establishes flagrant violation of the directives by the subordinate police staff. In his report placed before Justice TPS Mann, Gurdaspur chief judicial magistrate (CJM) has categorically concluded that Gurdaspur resident Chain Singh and Sonu, along with four others, were illegally detained in violation of the directives. The CJM, Harjinder Pal Singh, has, in fact, asserted: “I have come to the conclusion that station house officer Sukhdev Singh, police station Kalanaur, has illegally detained the petitioners and four others from October 1, 2007 to October 6, 2007, in violation of the guidelines in DK Basu”. The matter was brought to the notice of the high court by way of a petition alleging contempt of court. After Chain Singh and Sonu had accused the police of holding them illegally in violation of the directives, Justice Surya Kant of the high court had marked a fact-finding probe into the matter. The SHO too was, subsequently, asked to remain present in the court. As the case came up for hearing, SHO Sukhdev Singh was directed to file an affidavit “in respect of the contents of the report submitted by the CJM, Gurdaspur”. The affidavit is to be filed by April 16, the next date of hearing. The copy of the inquiry report was also directed to be handed over to the state counsel for forwarding it to the authorities concerned in the state government for initiating appropriate action against Sukhdev Singh. “Till the time the authorities decide to take action against Sukhdev Singh, he shall be immediately taken off from the post of the SHO and sent to the police lines, Gurdaspur,” Justice Mann asserted before parting with the order. The Apex Court, in the landmark judgment, had directed the person arrested must be made aware of his right to have someone informed of his arrest or detention, as soon as he is put under arrest or is detained. The other directions include: An entry must be made in the diary at the place of detention regarding the arrest of the person, which shall also disclose the name of the next friend of the person, who has been informed of the arrest, and the names and particulars of the police officials in whose custody the arrestee was. A Bench comprising Justices Tarun Chatterjee and HL Dattu posted the matter for further hearing on March 31. While Virk is seeking a CBI investigation in the corruption case filed by Punjab’s Vigilance Department against him, the state government wants apex court protection to officers in the department and police, against whom the HC has made adverse remarks. Virk, at present DGP in Maharashtra, has also moved the Punjab and Haryana HC, seeking direction to the state government to initiate action against the officials indicted by the court. The state government wants the apex court to expunge these adverse remarks for the time being. While Dushyant Dave and KK Khurana appeared for Punjab, PS Patwalia argued for Virk.